Look at how you�re standing. Does one hip jut forward? Is all your body weight balanced on one foot? Is one ma inta ining postur e 67 shoulder higher or does your head tilt to one side? Which parts of your body look tense? How are your shoulders, jaw, chest and stomach? Practice standing well at the supermarket checkout, while waiting for a bus, or at the water cooler. Stand with feet hip-width apart, outside edges parallel. Shift your bodyweight so it is equal between both feet: sway from side to side and forward and back to test your balance. Center your hips over your knees. Draw your abdominal muscles back and bring your buttocks together without gripping. Extend from hips to armpits equally on both sides. Broaden your chest, relax your shoulders, keeping them centered over your hips, and lift through the back of the neck. 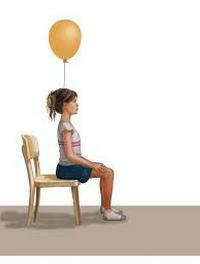 Whenever you feel old and saggy, imagine a helium-filled balloon is tied to the crown of your head. Feel it elongating the vertebrae at the back of the neck. Look forward. Finding a neutral (natural) position for the pelvis is one of the first lessons of Pilates. Lie on your back with knees bent, in line with your hips, feet flat on the floor a comfortable distance from your buttocks. Place the heels of your hands on your hip bones, fingers on your pubic bone. Tilt your pelvis up, so your lower back presses into the ground. Then roll your pelvis under so your lower back arches away from the floor. Now try to find a middle place, between flexion and extension, where your hip and pubic bones (and hands) are level. This is neutral. Practice lying, standing, and sitting in neutral. Technique This therapy reeducates the body away from mental and physical habits that over time can lead to back pain and aggravate stress-related symptoms, repetitive strain and other injuries. Work with a teacher to learn the precise instructions and experience a subtle, hands-on manipulation and balanceadjustment that helps you feel lighter, move more easily and elegantly, and look slimmer. Pelvic muscles weaken with age, especially after menopause. To guard against stress incontinence, do pelvic floor, or Kegel, exercises (see No. 350) daily for the rest of your life. This is vital if you have had children (especially after three or more vaginal deliveries). Muscles deep within the abdomen and pelvis support the spine against gravity like a corset, stabilizing and protecting youthful posture. 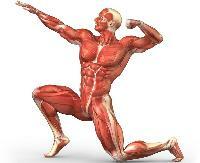 To locate these core muscles, sit upright, feet flat on the floor. 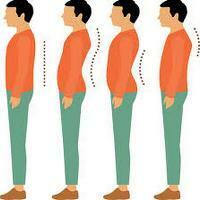 Exhaling, draw your abdominal muscles back, as if taking your navel toward your lower back. Feel a slight scooping, hollowing or zipping up. Don�t hold your breath or squeeze tightly. Release. Now pull up your pelvic floor muscles. Release. Breathing evenly, engage both sets of internal muscles, keeping your stomach and buttocks soft. Engage your core during everyday tasks: this gives particularly good support while driving. To safeguard the spine and joints in age, remember the rules of lifting and carrying: keep heavy loads close to your center of gravity, distribute weight evenly on right and left feet, and when picking up and putting down bend your legs, not your spine. Consciously engage your core muscles and inhale as you lift, exhale as you put down. If you have to carry heavy bags frequently, invest in a backpack with padded shoulder straps, safer for the spine than carrying loads over one shoulder. Look for a swimming stroke master class to ensure bad posture doesn�t hinder efficiency in the pool. Being aware of good posture in each stroke streamlines and coordinates leg and arm movements, protects the back, neck, and joints, and expands lung capacity. You will notice improved stamina and power in the water, too. Teachers trained in the Shaw Method, which applies the skills of the Alexander Technique to swimming, report remarkable improvements in older swimmers.